Enter the Gungeon Makes Failing Fun! 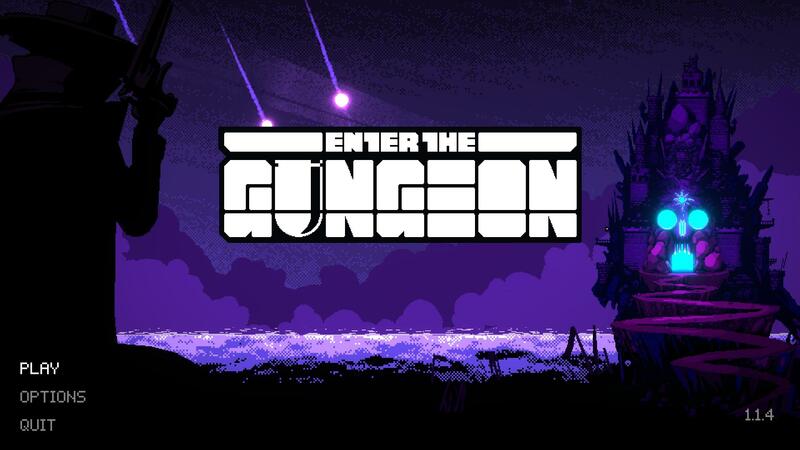 I don’t know if I have what it takes to beat Enter the Gungeon. It’s possible for skilled players to complete a run through the game’s six levels in under an hour. I am not a skilled player, at least not yet. A few moments ago, my sixtieth run at the game ended once again in failure. 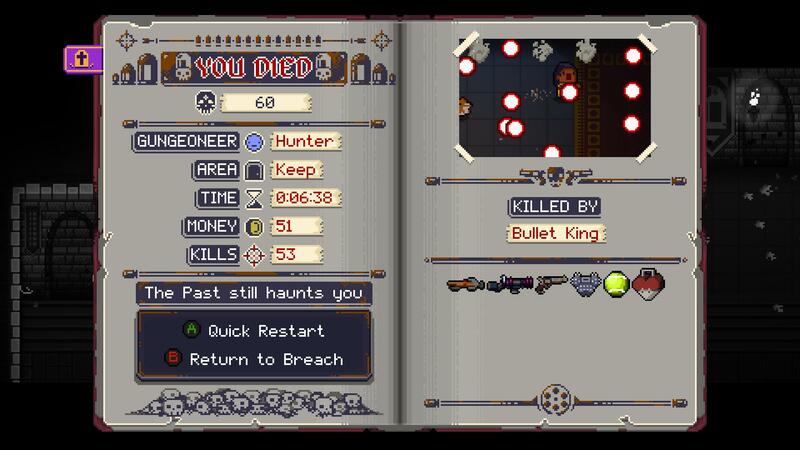 This time I was killed by the Bullet King, who I consider to be the easiest first-level boss. After reading the details on the game-over screen, I unconsciously tapped the button to immediately begin again. It’s a strange thing, because repeated failure doesn’t typically make games fun to play. And yet, after sixty attempts and twelve hours of play time I want to keep playing. This is the end of attempt #60. I died after 6 minutes and 38 seconds, with 53 kills in this attempt. 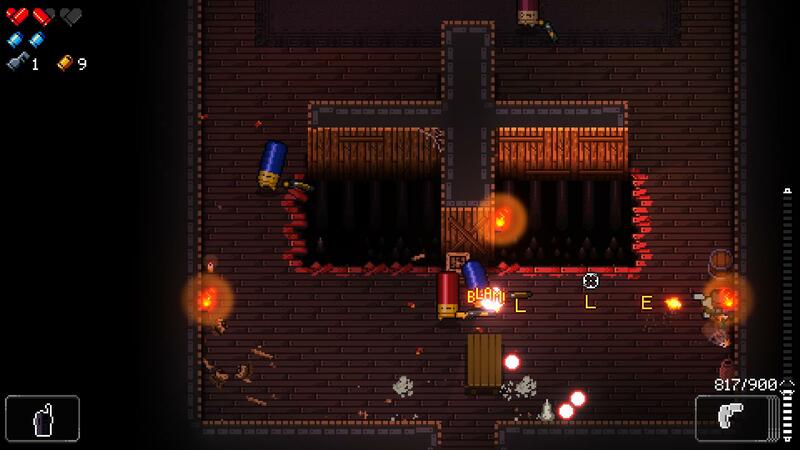 Gungeon is a deceptively simple game. It’s easy to play, especially with a controller. Left stick to move, right stick to aim. Different buttons fire, reload, dodge, and use items. Your objective: fight through an enemy-filled fortress in pursuit of a powerful artifact. Every level of the fortress is filled to the brim with those who would do you harm. They all protect the treasure contained within: a gun that can kill the past. This relic can be used to make what was done, undone. Simply put, this gun gives the one who wields it the ability to erase their failures from the past. You control any of four characters, the Marine, the Convict, the Pilot, or the Hunter. Each of them has a past that must be erased; tragedies and failures that must be set right. 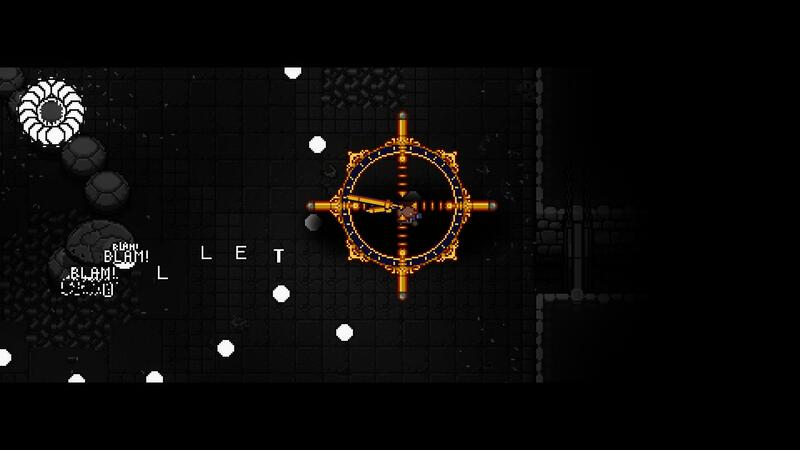 Only the most haunting of pasts can possibly be motivation enough to face what lies inside the Gungeon. I absolutely love the pixel art style of the game. Most of your enemies are bullets, and I mean that literally. 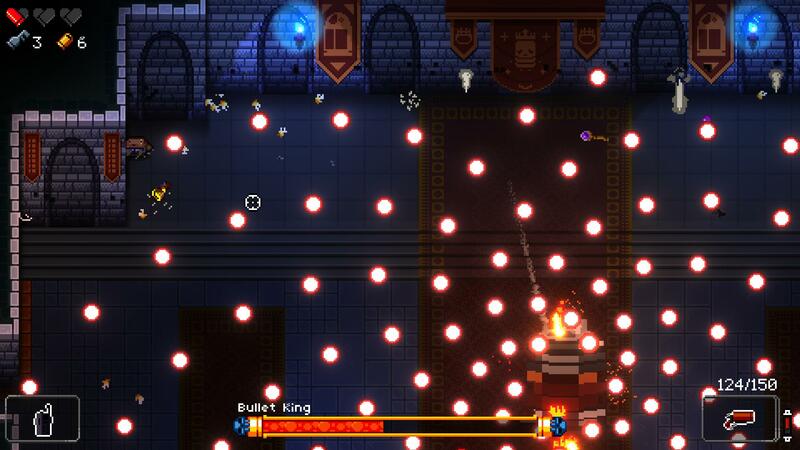 Enemies are sentient bullets that move and fire guns. Which, in turn, send actual bullets in your direction. I couldn’t make this stuff up. The simple controls allow you to devote your focus on the delicate and frenetic combat. Different classes of enemies have their own types of weapons and movement patterns. Some fire single, slow-moving projectiles. Others wind up and unleash a wall of bullets. My least favorite charge directly towards you and explode spectacularly. The hazards of the Gungeon prove that situational awareness is just as important as your reflexes. It’s a bad idea to be in corner when a Gun Nut unleashes a barrages of angry red projectiles in your direction. Shooting at bullets is ridiculously fun thanks to the lighthearted tone of the game as well as the varied and frequently tongue-in-cheek weapon design. Every gun, and there are a lot, has different strengths and weaknesses. Many of them are utterly entertaining to use, even if they aren’t entirely effective. For instance, The Bullet is a bullet. It fires guns. That also fire bullets. It’s asinine in the most entertaining of ways. My favorite weapon so far has to be the Lower Case r. Instead of firing bullets, it fires out letters that spell out the word “bullet”. Score a hit on an enemy, and instead of an explosion you’ll see the word “BLAM!” in glowing orange text. The Wind Up Gun is a homage to Futurama. It’s a blue rifle that shoots green projectiles and plays “Pop Goes the Weasel” as you wind the crank to reload it. I’ve also come across weapons such as a camera, a garbage gun, an M1, a mer-shotgun (a shotgun with a mermaid tail that shoots deadly water), a dripping barrel that fires deadly fish, the Thompson Machine Gun, shotguns, and the Klobbe; a fantastically useless weapon.The glee of using some of these more than makes up for the untimely deaths I suffer when wielding them. Look carefully. I’m not firing off bullets, I’m shooting off letters. Knowing when not to shoot is just as important as accurately unloading a magazine of bullets, rockets, letters, or fish. Your primary defense against the enemy onslaught is the dodge roll. Timed correctly, it will vault you safely over nearly any glowing red orb of death. Used recklessly, it’s just as effective at placing you in harm’s way. Boss encounters are usually a battle against one large enemy that can literally fill a room with unfriendly fire. These encounters are slowly teaching me that it’s okay not to be firing at enemies all the time. Sometimes the best thing to do is stop pulling the trigger and focus on not getting hit. This is what they call “bullet heck”. Gungeon is a punishing roguelike experience. This means that each level is procedurally generated. 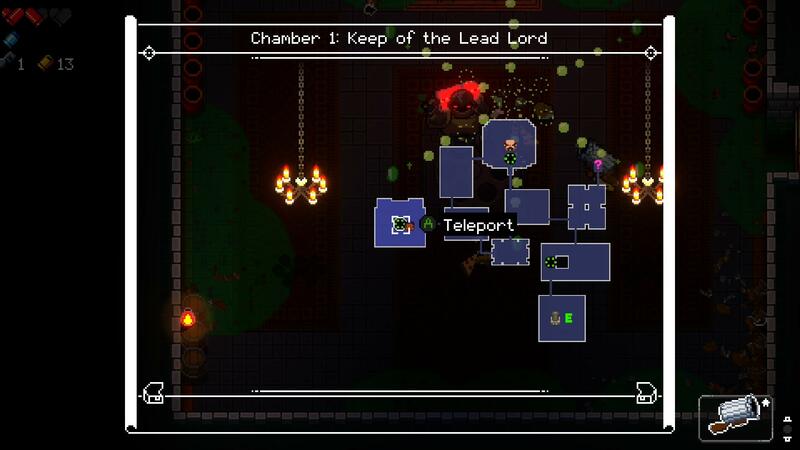 While every floor of the Gungeon will contain similar elements, the level layout, enemy makeup, and item drops will be different every time. Roguelike also means that permadeath is the name of the game. Die on level three, and you start again on level one. Though I must note that you don’t start completely from scratch after every death. Through the course of the game, you encounter other characters in the fortress. Setting them free allows them to set up shop in the game’s central hub so you can interact with them before starting a run. They offer special items or other quests to complete in return for rewards. Defeating bosses will give you a glowing green currency that survives permadeath. This currency can then be used to unlock new weapons and equipment that will show up as drops in the Gungeon in future attempts. This is not a game that’s meant to be rushed through. Nobody will sit down and breeze through to the final boss in an hour or two. Instead, Gungeon will sit installed on my hard drive for weeks and months. Over time I’ll chip away at it bit by bit, making one hard-earned step of progress at a time. I don’t know how long it will take for me to kill the past, but I know I’m going to have fun trying. I’m dead. Doesn’t this look fun? ?